The cult of Vijayashanthi is one of the lasting movie-going memories that I carry from my childhood. 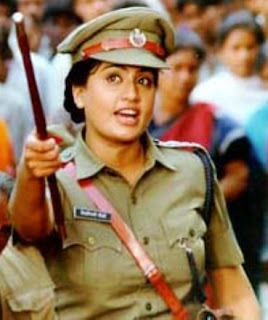 I have vague remembrances of watching several Vijayashanthi flicks with my mom and Vyjayanthi IPS  is one of them. It was dubbed from the telugu movie Kartavyam , for which she had won the National Award and this was supposedly the earliest movie in which the "Action heroine" tag was associated with her. Vijayashanthi's on-screen persona (which she successfully extrapolated towards her political career later) should have been constructed with a detailed strategy, taking into account, the existent social norms and gender dynamics in the late 1980s. In an outright patriarchal society where all authority is vested in men, a powerful woman on-screen (who can thrash men aside) naturally enthralls the female audience. Further, in the Police officer roles she enacted in Vyjayanthi IPS et al, her characters were packed with double the power-quotient, in a sense. At one level, it puts her across as a brave and physically sound woman who is not intimidated (or controlled) by the males. Secondly, the "power" that is inherently associated with the police - with which she audaciously "controls" the proceedings. Additionally, in the film promotions, Vijayashanthi was referred to as the "Lady Super Star", which again has some hidden sense. In the tamil cultural context, Super Star refers to Rajinikanth who can be seen as the macho symbol and on those lines, she is thus glorified as the lady with masculine traits. The Rajini-Vijayashanthi starrer Mannan , exploited this association quite successfully. Was watching (fast-forwarding) the Sneha starrer Bhavani , which fails miserably because of one simple reason - it's not contemporary. A remake of Vyjayanthi IPS after 20 years won't work. The film had an interesting catch though - instead of suggesting the "power" of the female protagonist symbolically or with her police attire, the film explicitly apotheoses Bhavani, thus combining two different genres of tamil cinema - the "Amman" cinema and the "female cop" cinema. Image1: Bhavani's image is juxtaposed with that of big-mustached Karuppa Saamy (male deity). Image2: Bhavani calls herself the Parasurama (One of Vishnu's avatars - male deity) with the axe. Image3: Bhavani as the female goddess.